This next set of episodes required me to bounce around in the airing order a bit in order to follow the official chronology, being 3.07, 3.02, and 3.04, and are interesting because, although they aren’t part of a unified arc, the way that a lot of these episodes are grouped, each one follows up on a previous arc and acts as a potential bridge for future stories, particularly the first one, whose conclusion demands continuation. Another Ahsoka-centric episode, this is one of the best outings for the character up to this point. 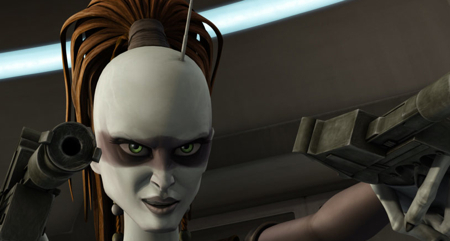 Although we’ve seen her sent out on missions by the Jedi Council either without Anakin or, as in the previous episode, “The Academy,” by herself as part of her continued training, I believe that this is the first time that she has basically given herself a mission, deciding to accompany Senator Amidala on a trip to a summit meeting on Alderaan, thanks to visions of the future that she has been receiving in her sleep that indicate that Padme’s life is in danger at the hands of the heretofore-assumed-dead Aurra Sing, the bounty hunter who was helping Boba Fett in his attempts on Mace Windu’s life. Her decision to become Padme’s protector here is significant for a number of reasons. Firstly, it indicates how she is maturing, and becoming stronger in the ways of the Force, and more sensitive to it when it speaks to her. The gradual increase in the visions’ vividness and detail speak to how she has taken the words of Masters Sinube and Plo to heart and taken the time to slow down and listen to both the Force and herself. Now, of course, she isn’t yet perfect. She still jumps the gun, charging in on Padme numerous times with limited information, and yet each mistake she makes increases her resolve to pay more attention to her dreams. She meditates, calms herself, and practices as much patience as she can muster, ultimately using these methods to zero in on Aurra’s location and save Padme’s life. It is also significant that Padme never loses faith in her or her abilities, even when there is no other proof besides Ahsoka’s word that something is wrong. Throughout genre stories, it’s such a rarity for people to believe in others’ visions, particularly when there’s no evidence, that it’s refreshing to see Padme’s trust in her never diminish. The situation also contains multiple resonances with later chapters in the Star Wars saga. Ahsoka’s visions of Padme in danger foreshadow both Luke’s visions of Han and Leia being tortured in Cloud City (it’s no narrative coincidence that Ahsoka goes to Yoda first), as well as, even more directly, Anakin’s visions of Padme dying in childbirth that will ironically lead not only to his transformation into Darth Vader but even to the Fall of the Republic, when he aids Palpatine against Windu. By having Ahsoka be the one to get these visions and protect Padme here, then, the show is deliberately contrasting this Padawan with her Master. Despite many similarities to Anakin, Padme is beginning to learn better Jedi control than he is. She also isn’t as close to the situation as Anakin would have been, given that Padme is secretly his wife, demonstrating how a certain level of emotional remove is a good thing in this situation. I’m additionally glad that Anakin isn’t a part of this story, because, as with “Conspiracy,” it gives us an opportunity to see Padme stand completely on her own and not in relation to Anakin, while the fact that she is being protected by a young woman younger than her removes any potential gender/damsel-in-distress issues. Not only does she not need to be rescued by a man, but she is no damsel. Even when she is shot, the threat to her life now completely apparent, she refuses to back down and not give her speech, which would seem to be the reason behind the assassination attempts. What becomes even more interesting is when we learn that it has nothing to do with her speech. It isn’t politically motivated at all. This is actually, in fact, the result of a personal vendetta against Padme from Ziro the Hutt, who she helped incarcerate all the way back at the start of the series. I love this twist not only for building on series history and not only for subverting expectations based on previous assassination attempts against other political figures throughout the series, but also, because, again, Padme isn’t being targeted here due to what she represents politically or philosophically, or in order to make any sort of statement, or to cause Anakin anguish as Palpatine will later use Anakin’s visions in order to drive him. No, it is just simple revenge for a brave act that she herself did out of her own awesomeness. There is also, of course, added resonance regarding the fact that Ahsoka saves Padme’s life on Alderaan, the very planet upon which Padme’s daughter, Leia, will be raised by Bail Organa, the senator who invited her here, and which will one day be destroyed by the Empire that Padme’s husband will one day help rule, as he observes their daughter (whose identity he won’t know at the time) watching in horror. hey there and thank you to your information ? I have definitely picked up anything new from proper here. I did however experience a few technical points the use of this web site, since I skilled to reload the site lots of instances prior to I could get it to load correctly. I were pondering if your web host is OK? No longer that I am complaining, however slow loading circumstances instances will often impact your placement in google and could harm your high-quality ranking if ads and marketing with Adwords. Well I’m including this RSS to my email and can glance out for much more of your respective interesting content. Ensure that you update this once more very soon..